For our fifth article in this series, we will take a look at 10 interesting boy names that are currently not ranking within the Top 1000 chart. This chart maps out the most popular names according to Social Security data every year. The year we're focusing on is 2015. As you know, the more articles there are, the further down on the charts we explore. We've hit the 1,200s now. These names are getting more and more rare as we go! So let's get started! Murphy (148 births - #1225) - Murphy comes from an Irish surname, Ó Murchadha, meaning "descendant of Murchadh". Murchadh comes from the Gaelic elements muir meaning "sea" and cadh meaning "warrior". In the US, Murphy has been around since the 1880s. It has never had more than 100 births per year until recently. Since 2010, the name has started inching upward for boys. Since 1987, it has been given to girls too. Brighton (147 births - #1228) - Brighton is said to be an English surname literally meaning "bright town" or "fair town". This name has only been on record in the US since 1983 for boys and 1986 for girls. It climbed a bit faster for males, earning 147 births in 2015. There were 102 females. Which gender do you prefer it on? Alton (146 births - #1232) - Alton comes from an Old English surname. It was taken from a place name that means "town at the source of the river." For boys, Alton has been used in the US since 1880 on record, and since 1904 for girls. It ranked well for boys until 1999 when it left the Top 1000. For girls, it was never consistently used and died out by 1989. Cael (145 births - #1240) - Cáel, with the accent, is an Irish name. It comes from the Gaelic caol meaning "slender". This name popped up for boys in 1989 in the US and it ranked in the Top 1000 from 2002 until 2012. Could it return to the charts soon? Clifford (145 births - #1241) - This name is very straight forward. Clifford means "ford by a cliff" in Old English. It comes from a surname which came from a place name. This name ranked in the Top 100 from 1886 to 1946. It left the Top 1000 in 2006. Noble (144 births - #1250) - Noble is a word I'm sure you're familiar with. Noble could refer to an aristocrat, or a person having fine personal qualities or high moral principles. Noble comes from an English surname. This name has been used in the US for boys since 1880. It was in the Top 1000 until 1954, but it has yet to come back even though its births per year are starting to climb. Amarion (141 births - #1265) - Amarion is possibly a long form of Amari. Both names are relatively unknown in their origins and meanings but they tend to be used by African Americans and Western Africans most frequently. Amari has been around since 1974 for boys and 1980 for girls. Amarion, though, arrived in the US for boys in 1998. It ranked from 2002-2005 and again in 2007. It's only been used a handful of times for girls from 2002-2004. Monroe (141 births - #1270) - There is a river in Ireland named the Roe. The name Monroe comes from a Scottish surname meaning "from the mouth of the Roe". This name started out as a boy's name, dating back to 1880 but left the Top 1000 in 1972. For girls, it appeared on the charts in 1996 and entered the Top 1000 in 2012. Much of this may be inspired by late Hollywood starlet Marilyn Monroe. Eamon (140 births - #1276) - Eamon is a variant of the Irish name Éamonn which is a form of Edmund. Edmund comes from the Old English elements ead meaning "wealth" and mund meaning "protection". In the US, this name popped up around 1920 and 1940, but it wasn't until the late 1950s that it gained consistent usage. However, it has never been in the Top 1000. Caius (138 births - #1283) - Caius is the Roman variant of the name Gaius. It's exact meaning is uncertain but it is possibly derived from the Latin gaudere meaning "to rejoice". Gaius was a common Roman praenomen belonging to both Gaius Julius Caesar and Gaius Octavius. In the US, Caius has only been used since 1994. While it has never been in the Top 1000, it is gaining more births per year every year. Which of these barely-used names do you like most? Which have the most potential to actually climb the charts soon? This interesting name comes from our list of names ending with the letters "-gy". There are not many -gy names. In fact, there were only two decent options for boys, Iggy and Ziggy. I chose to learn a bit more about Ziggy. Have you ever heard of this name before? Perhaps in the pop culture world, you've heard of the late Bob Marley's musician son named Ziggy. Where does the name come from? For Ziggy Marley, it's a nickname. His real name is David Nesta Marley. According to Bob Marley, Ziggy is just a nickname he gave his son meaning "little spliff". He may have been inspired by David Bowie's album "Ziggy Stardust". Ziggy Stardust, of course, was David Bowie's alter ego. Bowie was quoted in Rolling Stone Magazine as saying that Ziggy was "one of the few Christian names I could find beginning with the letter Z". Later, he also said he was inspired by a tailor shop called Ziggy's. It is possible that Ziggy doesn't mean anything. It is also possible that it's a short form of the name Zigfried, a form of the German Siegfried. Siegfried comes from the elements sigu meaning "victory" and frid meaning "peace". 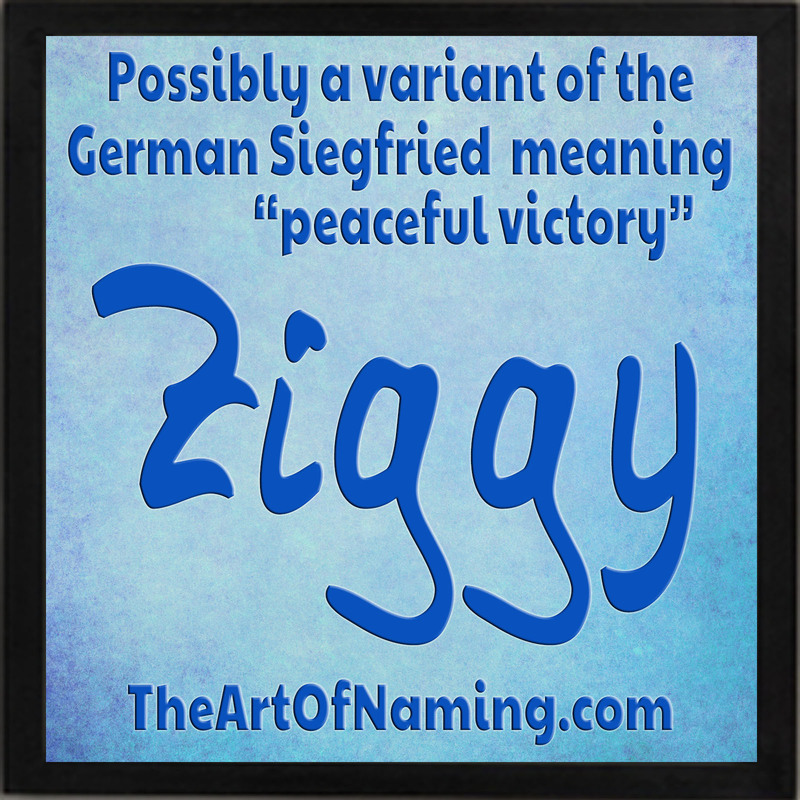 The meaning "peaceful victory" is appealing, but how common is this name? It first popped up in the US with 5 male births in 1988; another 5 appeared in 1995. By 2000, this name gained some consistent usage. The most births it has ever had in a single year was 44 male births which occurred in both 2014 and 2015. It is an unusual name but it has a cool vibe with pop culture associations. Could Ziggy ever catch on? What would you pair with Ziggy? What do you think of it? Today's featured name comes from our list of names that end with the letters "-fy". There weren't a ton of choices, but I picked out one of the most interesting names on that list. 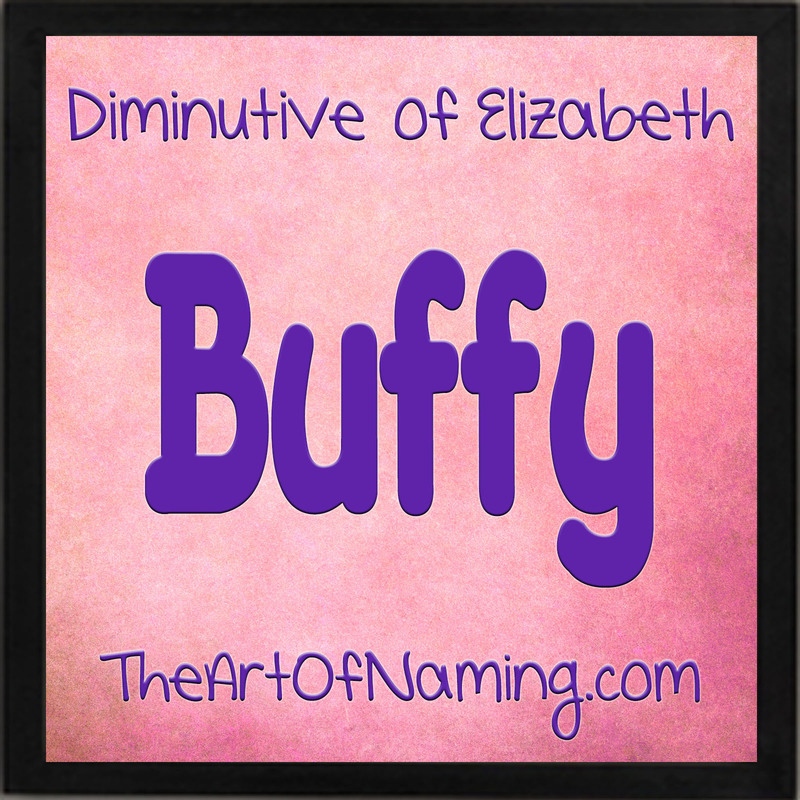 Buffy is one of many diminutives of the name Elizabeth. 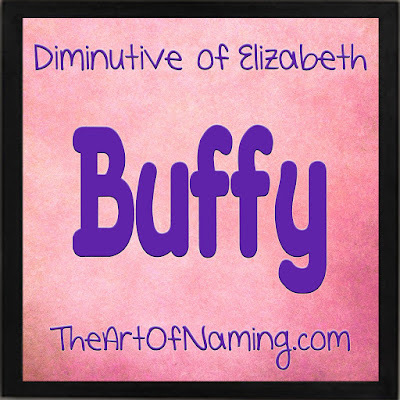 From the Hebrew name Elisheva, Elizabeth (and therefore Buffy) means "my God is an oath" or "my God is abundance". Elizabeth is known for its abundance of nicknames, short forms and diminutive options, which makes it very versatile if used in full. It has been extremely popular over the years, consistently being used as both a first name and a middle name for girls. However, Buffy is definitely one of the more obscure options as a nickname for Elizabeth. As a stand-alone full given name, Buffy is almost non-existent. It first appeared on record in the US in 1951. Nearly overnight between 1965 and 1966, Buffy caught on for a brief stint. It popped onto the Top 1000 chart at #793 in 1967, and climbed as high as #530 in 1972 which accounted for 319 births. By 1978, though, Buffy was already on its way out the popularity door. By 1991, it wasn't being used at all except for a handful of births from 2002-2005, and a few in 2013. However, you do need to take into consideration its biggest association: Buffy the Vampire Slayer, of course, was a television show that ran from 1997-2003. What do you think of Buffy? What names would you pair with it? 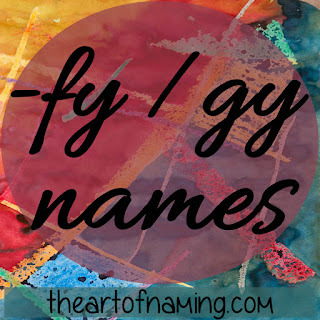 Names Ending with the Letters "-fy" and -"gy"
This categorization of names is admittedly limited and unusual but it may strike a chord for certain parents seeking a specific sound. Continuing our series that has already featured -ay, -by, -cy, -dy and -ey names, I present the interesting short list of -fy and -gy names. Since the list is so short, I combined the two and included -fie and -gie names as well. Many of these might actually be considered nicknames more so than given names. 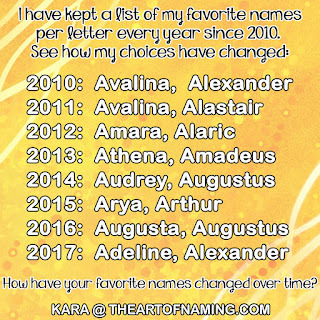 Most Americans are not big fans of this style of names, however in England and Wales, names like Effie and Alfie are considered full, stand-alone names and rank fairly well on the popularity charts. Would you ever use any of these names as a full given name on the birth certificate? If so, which one? The record of Kings and Queens of Scotland dates back to the year 843. Over the centuries, there were many different houses that ruled including the House of Alpin, the House of Dunkeld, the Canmores, the Balliols, the Bruces, and the Stewart/Stuarts. There were also points in history that Scotland, Great Britain and Ireland all fell under the same rule rather than running their countries separately. This happened in the time of the Hanovers followed by the currently reigning Windsor house. 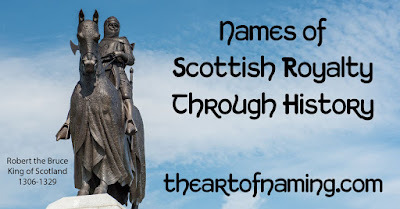 Let's take a look back in history at the names of the rulers of Scotland in specific. I chose Scotland and this time period because of the variety of interesting names of their rulers. Now, this isn't going to be a history lesson. I won't pretend to be well versed in European History. This is strictly about the interesting names. After this, Scotland fell under England's rule. For more names of rulers after this time period, take a look at our post about the names of Male Rulers of England, and our list of Female Royalty Names too. Kenneth - This king's name was Anglicized from the Gaelic Cináed meaning "born of fire". Kenneth also comes from the Gaelic name Coinneach, derived from caoin meaning "handsome". In the US, Kenneth had the most births within the mid-1950s. It was a Top 100 name from 1898-2001. In 2015 it ranked at #199. Donald - From the Gaelic name Domhnall, Donald means "ruler of the world". It comes from the old Celtic elements dumno meaning "world" and val meaning "rule". This name has been very popular in Scotland. In the US, it was most popular from the 1930s-1950s. In 2015, there were 690 boys given the name for a rank of #441. Constantine - This name comes from the Latin name Constantinus, which comes from Constans meaning "constant, steadfast". Constantine has been around since the early 1900s in the US, but it has never been popular. 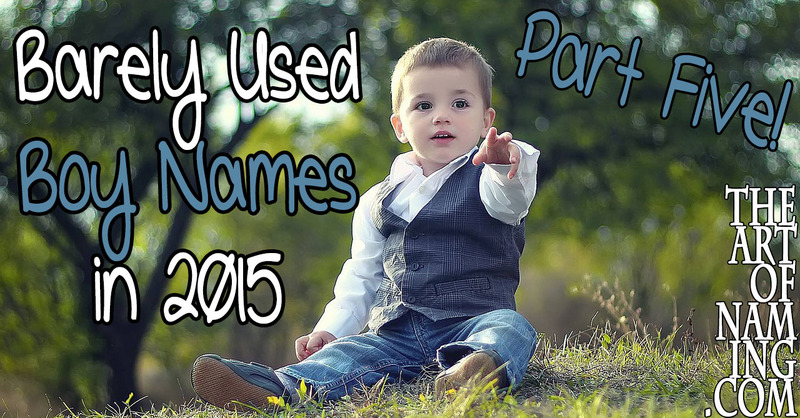 There were 91 boys given the name in 2015. Malcolm - Malcolm comes from the Scottish Máel Coluim meaning "disciple of Saint Columba". This king killed Macbeth who had usurped the throne and murdered his father. Shakespeare's characters in "Macbeth" (1606) are based on these kings. Malcolm has always ranked in the Top 1000, and its best year was 1992 at #206. In 2015, it was #420. Duncan - This name is derived from the Gaelic name Donnchadh which means "brown warrior". There were two kings of Scotland with this name and one of them was also featured in Shakespeare's 'Macbeth'. Duncan has always ranked in the Top 1000 but it's never ranked all that popular. It ranked best in 1997 at #378. It was at #793 in 2015. Edgar - Edgar comes from the Old English elements ead meaning "wealth, fortune" and gar meaning "spear". Edgar ranked well back in 1918 but declined a bit after that until the mid-1980s. Currently, Edgar ranked at #317 in 2015. Alexander - Alexander comes from the elements alexo meaning "to defend" and aner meaning "man". This is a common name that was used for Scottish kings as well as those from Poland, Yugoslavia, Russia and others. Alexander has always been used in the US, but it really peaked in 1993 with over 20k births. It's been a top 10 name since 2008, currently ranking at #8. David - David comes from the Hebrew dwd which means "beloved". Beside the king of Israel, there were two Scottish kings named David along with many other important men through history. David has always been a Top 50 name. It even ranked at #1 in 1960. In 2015, it is down to #18. William - William comes from wil meaning "will, desire" and helm meaning "helmet, protection", both Germanic elements composing the name Willahelm. William has been used well by the Normans, the English, the Scots and others. William was a Top 10 name from 1880 to 1975, including many years at #2. It dipped to the teens and twenties but it is currently ranked back up at #5. John - John comes from the Hebrew Yochanan meaning "YAHWEH is gracious". It is possibly the most popular name for boys in history, having been given to a fifth of all English boys in the Middle Ages. In the US, it has always been well used. It was #1 from 1880-1923 and remained in the Top 10 until 1986. In 2015, it is down to #26. Edward - Edward comes from the Old English elements ead meaning "wealth" and weard meaning "guard". Edward has been used throughout Europe in various spellings. It ranked in the Top 100 in the US from 1880-1997. It's slowly inching downward now and it ranked at #158 in 2015. Robert - Robert comes from the Germanic name Hrodebert which contains the elements hrod meaning "fame" and beraht meaning "bright". 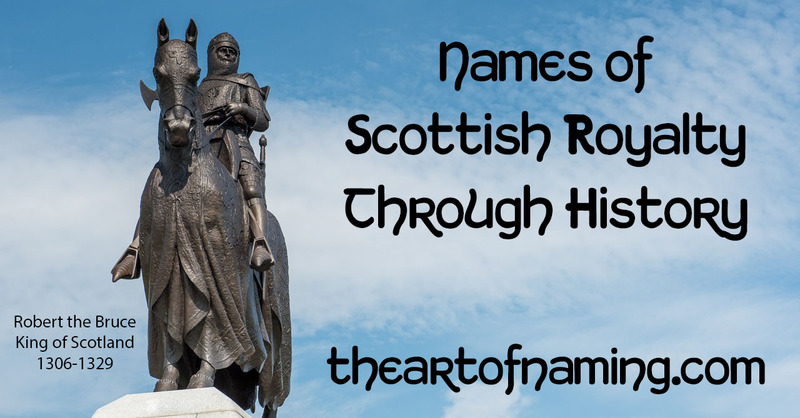 Three kings of Scotland had this name, including the pictured Robert the Bruce. In the US, Robert was the #1 name from 1924 to 1939. It was in the Top 10 all those years until 1989. It remains in the Top 100, ranking at #63 in 2015 which is the lowest it has ever ranked. James - James comes from the Latin Iacomus which comes from the Greek Iakobos, which comes from the Hebrew Ya'aqov. It is said to mean "supplanter". King James ruled Scotland before becoming James I of England in the House of Stuart. As a name, James ranked in the Top 5 for 100 years (1880-1980), it dipped to the teens, but James was back up to #7 in 2015. Margaret - Margaret comes from the Latin margarita, derived from the Greek margarites meaning "pearl". There were Queen Margarets in Scotland and Denmark, and a princess in Hungary. Margaret has always ranked well in the US. It's biggest year was 1921, but it was in the Top 10 until 1939. It left the Top 100 in the 1970s and 1980s, falling to 2015's rank of #154. Mary - Mary ultimately comes from the Hebrew Miryam. It's meaning isn't certain but theories include "sea of bitterness", "rebelliousness", and "wished for child". It's also possible that Mary comes from the Egyptian name mry meaning "beloved". There have been two Queen Marys of England and one of Scotland. In the US, Mary has been extremely popular, it was #1 or #2 from 1880-1965. Mary left the Top 100 in 2009, but still ranks at #124 in 2015. Which of these royal names do you love the most?